I have been busy the past few days getting ready for a garage sale we are having at the church this weekend. A bunch of us are doing the Financial Peace University by Dave Ramsey. We are selling things we don’t use to make money to put toward our debt. This was about 2 weeks ago. Then, a couple days later Lauryn and I were in the kitchen and I was getting her dinner ready. She was in her high chair and I was over by the stove. When I was facing the stove, I heard her say “Hold me, Angel, hold me!” I turned around and saw that she was looking up straight ahead (not at me) with her arms held in the air - outstretched as if she was wanting to be picked up. It was really something! Then, later that week Lauryn and I took a walk around the block and she kept mentioning “angel”. I didn’t know exactly what she was saying, but she certainly was interested in Angel. Thank you, Erika, for sharing those stories with us. They mean more to us than you could ever know. They remind us that Emma is more than a pile in my room. Her life had value and meaning beyond what we even know. It means so much to hear people speak her name and tell us they miss her too. It is good to know that she is not forgotten. After reading that email I found the courage to start sorting through the pile and as I did, I realized that Emma could never be put in a box and I’m not going to try. I am going to keep those special things around us so that the things that Emma touched and loved will continue to be cherished and held. I want her life to be remembered with smiles and tears. I am learning that all the good things in life are mixed up with joy and sorrow. You can’t have one without the other. Thanks for keeping me on your blog list. I know this is always a very difficult month for you guys and I pray that September will one day change for you - not the memories that you hold so dear, but that the peace you have will become stronger. I have been blessed to be one of the ones who have known you with and without Emma in our lives. But most of all I was blessed to have Emma as part of my life as well. Thanks for sharing her. As you know, I am one of those who love to look back and talk of memories to keep them fresh in my mind. 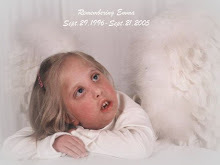 As I was reading your blog, I thought of all the times I spent with Emma and the way she touched and still touches me. There is not a time I hear a plastic bottle crinkle that I don't expect to hear Emma giggle. She is such a precious, precious child. You know I'm here if you ever need ANYTHING. Love You Guys!